Work: Captain of a South Carolina Regimental Company, 1775; Delegate to the Continental Congress, 1776. 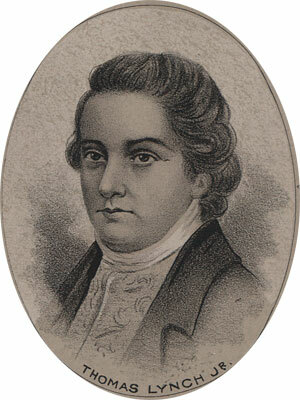 Thomas Lynch, Jr., was born in South Carolina on August 5, 1749. He received an education in England and graduated with honors at Cambridge. He studied law in London and then returned home in 1772. He was politically engaged as soon as he returned home, and was commissioned a company commander in the South Carolina regiment in 1775. Soon afterward he was elected to a seat in the Continental Congress. He fell ill shortly after signing the Declaration and retired from the Congress. At the close of 1776 he and his wife sailed for the West Indies. The ship disappeared and there is no record of his life after.